Copyright 2014-2017 - Brainwy Software Ltda. 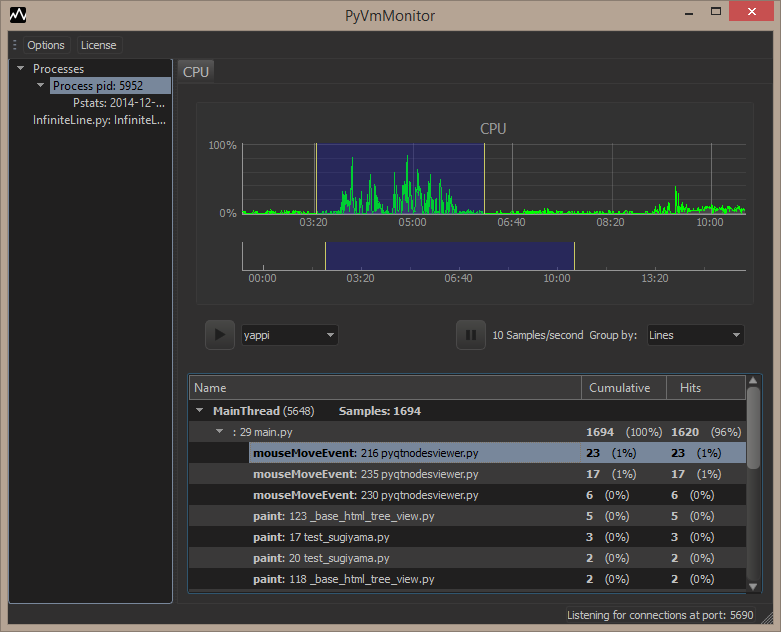 PyVmMonitor is a profiler with a simple goal: being the best way to profile a Python program. Fixed issue on graph generation on cases without a root (only with cycles). Fixed packaging issue on PyVmMonitor on Mac OS X. Attach to now works in Python 3.5 and Python 3.6. Fixed issue opening PyVmMonitor on Mac OS X.
Pstats files may be passed in the command line to be opened in pyvmmonitor-ui. Fixed issue opening PyVmMonitor in Mac OS (El Capitan). Opening PStats file may fail because it's linked to a Python version, so, in such a situation, PyVmMonitor allows opening it using a different interpreter. Command line examples are properly wrapped with quotes on Windows. PyDev integration was improved on Linux/MacOS. PyCharm integration is now available. Fixed issue when PyVmMonitor was used with Python 3. The pyvmmmonitor.profile_method() decorator now has an optional 'condition' argument (see: PyVmMonitor API for details). A qt.conf is now distributed so that when running PyVmMonitor it doesn't conflict with a previously installed PySide in the system.